Milan: Three cars are torched overnight. One of them belongs to a trade unionist at Alfa Romeo. Rome: A neo-fascist is assaulted outside of his home. Milan: A five person commando enters the Magneti Marelli location on via Crescenzago during a meeting. They draw the five pointed star of the Red Brigades on the wall and open fire. A bullet strikes the head of internal security. 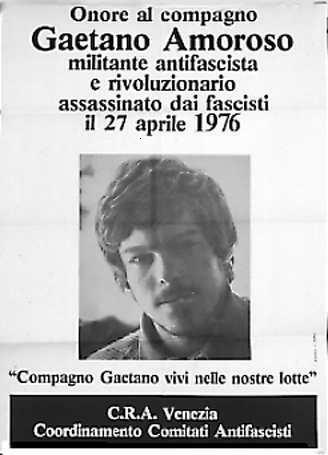 On the fourth of April a flier signed “build the armed power of the working class” claims responsibility for the action. Massa Carrara: Serious clashes between police and militants of the extra-parliamentary left protesting the shortage of housing. Pistoia: An incendiary attack damages the entranceway to the local prison. Lucca: Five pistol shots against the entranceway to the offices of Lotta Continua. Milan: Arson against the production dept of the food conglomerate Motta. Massive damage. Rome: Extreme left militant Mario Salvi is shot and killed by law enforcement officer Domenico Velluto as he runs away after throwing Molotov cocktails at the ministry of justice. The incident causes enormous controversy and Velluto is arrested for premeditated murder on April 15th. 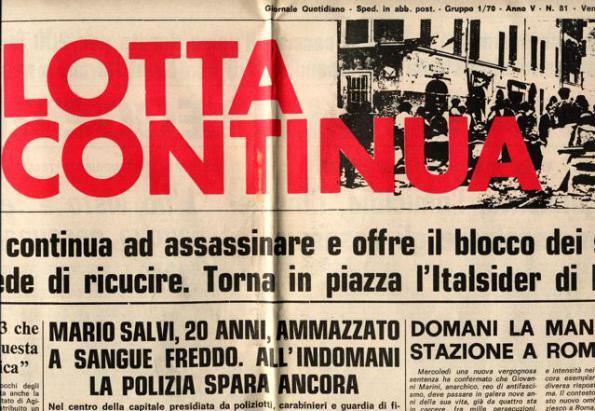 Rome: Serious clashes in the city center in response to the killing of Salvi the day before. Bombs are thrown at the headquarters of the DC and militants attempt to storm the ministry of justice. Dozens of shop windows are broken and dozens of pistol rounds are fired by unknown persons against the police. Florence: A Molotov cocktail is thrown at the district offices of the DC in the Africo neighborhood. Milan: A car bomb explodes in front of the police station in the Porta Ticinese district. Turin: Two Standa department stores are seriously damaged by incendiary attacks. Varese: Arson attack destroys the car of an executive of the Bassani Spa company. Naples: Clashes between police and the unemployed. The latter are attempting to occupy a hospital where they demand to be hired. Heavy stone pelting against the police. Genoa: Two Molotov cocktails are thrown at the carabinieri station in Bolzaneto. Trento: Six Molotov cocktails are thrown at the residence of Dr. Costanzo Gastaldi, head of the local hospital and supporter of the Liberal Party. Alghero: A Molotov cocktail is thrown at a district office of the MSI. Turin: In an ambush near his home a department head of Fiat Mirafiori’s workshop 78 is shot five times in the legs. The BR claims responsibility for the action in a statement in which they deny being responsible for the actions carried out at Rivalta and Mirafiori between March and April. Turin: Arson attack on the upholstery department at Fiat Rivalta. Serious damage. Rome: Molotov cocktail attack on the San Saba district office of the DC. Turin: Arson attacks on the cars of a Fiat deputy manager and a foreman. Rome: The police brutally attack hundreds of disabled people peacefully protesting the inadequacies of municipal assistance. Limbati: The home of Francesco De Vita, local secretary for the DC is seriously damaged in a bomb attack. Castel Maggiore: Arson attack devastates Cogerin storage facilities causing serious damage. Turin: The Red Brigades claim responsibility for an arson attack on the Textiles dept at Mirafiori. Viareggio: Fascists Molotov a PSI district office. National: Bomb and Molotov attacks on carabinieri barracks in Rome, Bari, Nuoro, Enna, Massa Carrara, Naples and Pordenone. 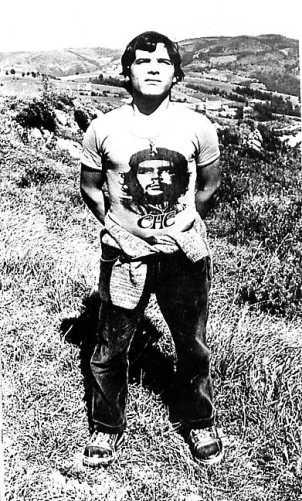 The attack on the Rome barracks is claimed by the “Communist Commando Mario Salvi”. 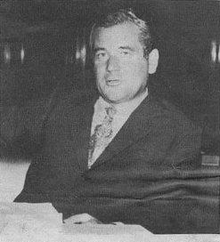 Calenzano: Four Molotov cocktails are thrown at the offices of the company La Pasquale. The action is claimed by “Armed Struggle for Communism” as a protest against black market labor. Florence: Some Molotov cocktails are thrown at the Spanish Consulate. Teramo: The local jail is seriously damaged by a riot. Rome: Arson attack destroys the paper supplies of a print shop. National: Bomb attacks on carabinieri barracks in Bari and Nuoro. Catania: CGIL unionist in the construction trade Domenico Cotugno known for his left wing politics is shot five times in the leg with a pistol. Legnano: A group of fascists break into a local PCI office during the night and trash it. Agrigento: Bomb attack destroys the car of the PSI city council member Gerardo Bruno. Milan: Arson attack on the car of the GMA executive Luigi Sollecito. No claim of responsibility. Bologna: The Red Brigades claims responsibility for an arson attack on the President of the Industrial Association, Eugenio Menarini. Rome: A commando opens fire on the president of the Petroleum Union Giovanni Theodoli, wounding him multiple times. The action is claimed by the Armed Communist Formations (FCA). Rome: Three militants of the MSI Youth Front throw Molotov cocktails and fire guns at a high school. They are arrested by police. Milan: Joint commando of the Red Brigades and the Armed Proletarian Nuclei raids the offices of the institute for prevention of the District Inspectorate, restrains the clerks and seizes various documents. Ostia: Molotov cocktails are thrown at a leftist club. Padua: Arson attack damages a PDUP district office. Rome: A Molotov cocktail is thrown at the entranceway of a DC district office. Milan: Clashes between police and militants of the extra-parliamentary left trying to join a trade union celebration of April 25th. Milan: Two militants of the MSI Youth Front are attacked and beaten on the premises of the Catholic University. Rome: Three explosive devices with chemical triggers are found outside of a carabinieri barracks. 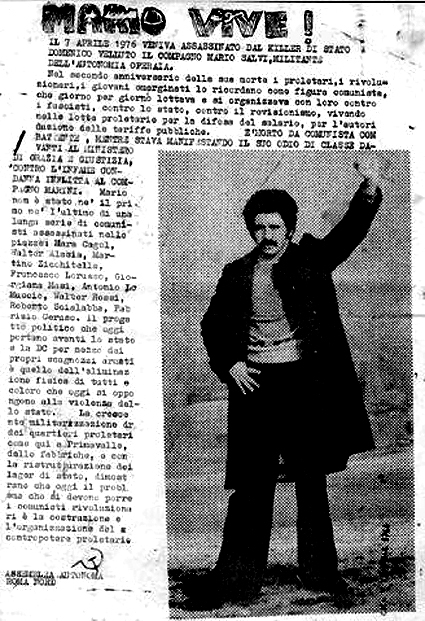 The attack which fails due to a technical error is claimed by the “Communist Commando Mario Salvi”. Reggio Calabria: Arson attacks which cause serious damage are carried out against two high schools. The actions are claimed by forces within the area of autonomy. Milan: In retaliation for a Molotov attack on one of their district offices some MSI militants attack a group of leftists stabbing three people. Gaetano Amoroso dies of his wounds after two weeks. Genoa: A group of armed and masked individuals raid the offices of Intersind [the public sector employer's association]. After binding and gaging those present they write graffiti in support of the Red Brigades. Milan: Some militants of the extreme left throw Molotov cocktails at the entrance of the private school “Studium”. A car is destroyed. Milan: Enrico Pedenovi, MSI attorney and provincial councilor is ambushed by three men while exiting his car and shot five times in the chest. Some militants of Front Line will be sentenced for this killing in 1984. Rome: Five attacks occur on left wing militants in various areas of the city in retaliation for recent events in Milan in coordination with a demonstration by the far right. Naples: Two young people who refuse to accept a flier from MSI militants are attacked and beaten. Shortly afterwards a PCI district office is attacked and burned. Twenty people are injured in the clashes. Padua: Clashes between MSI supporters and militants of the extreme left. Numerous Molotov cocktails are thrown. Milan: A group of neo-fascists attacks a left wing club. Serious damage. Rome: The Appio district office of the PCI is burnt and damaged. Bologna: Clashes in the city center between MSI supporters and extreme left militants. Naples: Street fighting between left wing militants and neo-fascists. Rome: The “Paredes Manot Internationalist Brigade” torches a library of Spanish history.